Apple has released iOS 11.1.1 for iPhone, iPad, and iPod touch, a minor point release update with bug fixes. The update is recommended for all users running a prior version of iOS 11. Notably, the iOS 11.1.1 software update aims to fix the prolific and annoying bug which causes the “i” character to be replaced with a question mark box. Additionally, the minor update apparently fixes an issue where Hey Siri voice activation stops working. It’s unclear if other bugs or issues are also addressed in the software update. Users can download the iOS 11.1.1 update through the Settings app, iTunes, or as IPSW firmware files. The easiest way to get iOS 11.1.1 is through the OTA update mechanism in Settings app. Always backup an iPhone or iPad before installing any software update, even minor point release updates. The iPhone or iPad will update and reboot automatically to complete the installation. 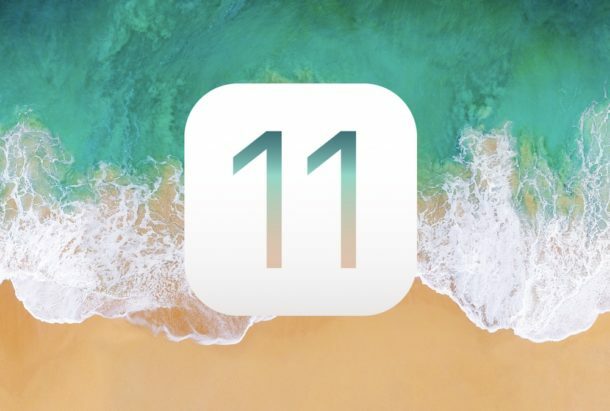 Users can also install iOS 11.1.1 through iTunes by connecting their device to a computer and updating to the latest iOS release when it becomes available. After iOS 11.1.1 is installed users can return to their text replacement Settings and remove the “i” entry they may have added to get around the annoying question mark box auto-correct bug. Using IPSW to update iOS is considered advanced, but is not particularly difficult. Why don’t Apple give iPhoneX users the option to go directly to the home page without having to go through the extra step of swiping up to get there. As my pet hate is the amount of data, which is never shown anywhere easily, delayed update to 11.1 until yesterday 2.5Gb. That’s a lot for one months data allowance, now there ia another a day later! Of course it won’t be a small package, sure to be another 2.5Gb. Yahoo mail abruptly stopped working. I deleted my account, then re set it up. I tried everything. I can no longer use the mail app with Yahoo. I can only use the web interface. The set password field is missing from the mail settings. Surely I am not the only one. Both my ipad and my iphone suffered from the same issue. For some reason I got censored. I shall keep posting. Yahoo mail cannot send, anymore. Try it yourself. It says “Your yahoo password is incorrect “, and offers to take me to settings. The password field is gone! Here is proof that ios 11.x.x does not allow yahoo mail to work as of Nov 10. FWIW my Yahoo app still works on an iPad Air 2, so does my setup in Mail on an iPhone 8. I hope other bugs were fixed as well. Having WiFi problems with iPhone 6s and iPad Pro since updating to iOS 11. Point updates don’t seem to resolve the problem. Really annoying as soon as I find the time I will be downgrading back to 10.3 for properly working wifi. Tried all the remedies I could find on the web nothing has solved this so far.